Since I've been back in the UK I have been pondering my (almost) 3 weeks in the West Indies, St. Lucia and Antigua following the WT20 and having a great holiday in the process. So, on the field (the cricket one that is) what sticks in my mind after my return? There was the rather strange occurrence of umpires warning players for running on the pitch. Can you remember the last time you saw this happen in your domestic cricket wherever you may be on this globe? No I thought it unlikely. If you can, what about the time before that? Now I suspect you really are stuck! I have commented on this before (blog) and I can't say my views have changed; indeed they have hardened in view of the late information (shown in pale brown). I have watched the ODI series between Sri Lankan men and New Zealand and, in spite of one warning to a batsman simply awaiting the bowler too far down the wicket for the umpire's liking, the Law was once again observed in the breach with at least two instances in one match where I was aware of a player running the full length of the wicket in a perfect line from middle stump to middle stump. There were a number (dozens) of instances of what would have been considered infractions in the West Indies, but apparently aren't in New Zealand. All that said the umpires were in every other regard perhaps the best 'team' I have seen doing that role for quite some time. perhaps the message hasn't yet travelled all the way down south. The turn-out at matches was way above that I was expecting. Yes, of course, if the West Indies were playing you'd expect a decent crowd. I'm not sure, nonetheless, that I thought the stadium in St. Lucia would be as full as it was. If the TV coverage was representative, it seemed the crowd in Guyana was considerably less. What was perhaps more surprising was the size of the crowd when overseas teams were what was on view on a particular day. I am not sure how much difference it made but the organisers declared a 'party' to follow the second match of the day and when we had packed up our cameras, computers and other accoutrements there were still plenty there. This was a blessing to us as what might have been a chaotic situation as we tried to drive away was simply a normal traffic jam. I was especially pleased to watch some teams I haven't seen before (e.g. Bangladesh) but disappointed that the England/Sri Lanka match was rained off. Sri Lanka is a team I have seen only rarely and I was looking forward to a chance to photograph them again. The cancellation and the look at the forecast for the next 7 days or so caused one journalist to suggest this group should be moved elsewhere. This was NEVER going to be a serious question in spite of the fact the ICC thought to 'consider' it and then decide it wasn't practical. I am not sure they ever took the idea seriously as it was as plain as the nose on your face it was simply impossible, and just a journalist's stunt to raise a profile. 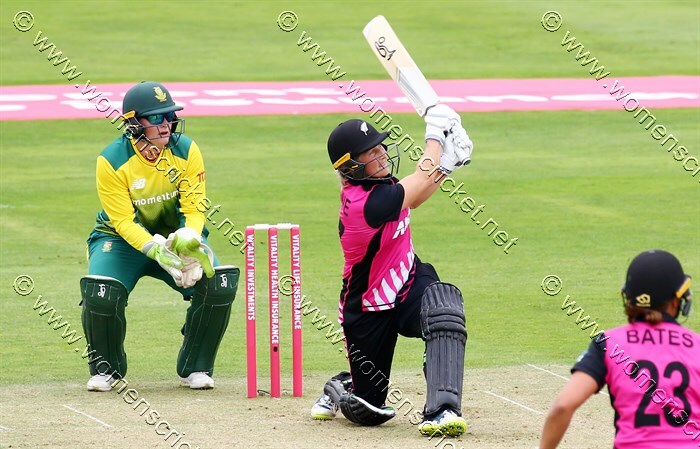 International Cricket Council rules state a women's T20 boundary "shall be longer than 59.43m (65 yds), and no shorter than 50.29m (55 yds), from the centre of the pitch". The men's boundaries "shall be longer than 82.29m (90 yds), and no shorter than 59.43m (65 yds) from the centre of the pitch". Conversions to Imperial measure by me! I was amused in converting these very 'odd' numbers i.e. ones with 2 decimal places to discover they are exact integers in yards. Now it made sense. They mean yards really but thought they'd best not say so... very droll. Anyway I was intrigued by this info, which I assume applies to ICC tournaments and would not, therefore, apply to the bi-lateral series that England will be playing this summer. Boundaries as large as those have not always applied in internationals here in the last few years. I wonder if the ODI boundaries are specified somewhere, but will I have the patience to go search - maybe - maybe not. The numbers above state the case really. I can remember as a 15 year old schoolboy (well, younger than that actually as I played U-15 for the school in my 2nd year at grammar school where I would have been 13) and we had boundaries closer to the men's than the women's. I would suggest that the strength of a twenty+ year old woman training full time in an international team would be much greater than me or any member of the team I was lucky enough to play in, but we didn't lack 6s in our game (not that I hit many!) and, perish the thought in modern day cricket, we also ran 3s (and that I seemed to do all too often). Or perhaps I should have second thoughts - maybe we were fitter and stronger as the sizes of boundaries today often tend to imply that women's teams simply aren't that fit. Having, during the last 12 months watched Devine clear the stand a couple of times at Taunton (a lower stand it's true but still a long hit), and seen the seats rattled by several players in the West Indies during the ICC's World T20, it's indicated these restrictions are quite unnecessary. I have never felt that a mishit should be rewarded with a 6 or even a 4 but modern boundaries make that not just possible but even likely on a number of occasions in every match. I argued in this blog a while back that it's a batsman's game and these boundaries are one of the principle reasons why. I know in T20 the basic premise is that the bowler is simply there as canon fodder but we have to hope that some of the nuance and subtlety of the cricket of a few decades ago can be retained or we may as well all pack up now and take up baseball where at least there is no pretence it's other than a 'see it, slog' it game. In our endeavour to make the game have a wider appeal, and behind that is the thought of MORE CASH, can we please not lose what makes cricket, cricket? You've heard the expression 'going the extra mile'. I'd be happy with an extra 5 yards! Next Page : Whither County Cricket?